A great deal of the success of your business (or lack thereof) is dictated by its location. Choosing the wrong place can be detrimental the prosperity of your enterprise. Luckily for you this can be easily remedied by our vetted services. 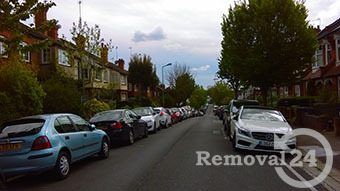 We are one of the longest existing removal companies in North West London and as such we have witnessed the huge growth that the industry has experienced during the years. The ever greater demand for office and home moves can only be satisfied by teams with enough experience, skill and motivation, which is where we come in. We are regarded as one of the best if not the best relocation services in North West London. Much of this reputation is thanks to the diligence and competence of our movers and packers. These men and women have been handpicked from only the best the industry has to offer. This strict selection permits the existence of a team, trained enough to handle any sort of moves (including commercial relocation), or move-related complications, and execute any other moving solutions you can think of in NW. Clothes make the man and in our humble opinion the same can be said about a relocation service and its equipment. We only buy the most eco-friendly and recyclable packing materials, which are put to perfect use by our handy packers and movers (best ones in NW). This way your belonging are certain to reach their destination rapidly and safely – especially useful for business owners who are moving in North West London. Speaking of transportation: we have only the best vehicles around, operated by experienced and dependable drivers who take great pride in their job. This combination of excellent workers using such high quality materials leads to our astonishingly high success rate. Take advantage of our comfortable moving services right now by calling us or booking us online. Our employees don’t all undergo this strict training just to be movers at the end. We offer an entire gamma of different, supplementary services to clients in North West London, NW, which you can use at any time, just like the regular services. One of our most popular such services is the end of tenancy cleaning which we provide. Moving even with a relocation firm is extremely overbearing. And the other task that everybody dislikes just adds more the pressure that you are experiencing. Do the right call and hire us as soon as you need the help to save yourself a lot of headaches. We guarantee the landlord at your old place of business will have no choice but return your deposit. How do you take advantage of our work? We are glad you asked. We have done everting in our power to make the removal options offered in NW as convenient and as affordable as possible. For starters, reaching us requires little more than a phone call and an internet connection. You also receive, as an added bonus, full insurance and individually calculated work rates. Just do not forget to ask for a price quotation in advance as the rates are not consistent and they are entirely dependable on how hard the relocation job in North West London in question will be. Do not be afraid to contact us at any time as we work every day all day. We have tailored our man and van services to be child-friendly because we understand how stressful a property removal in North West London can be for your children and want to make the transition as smooth and stress-free as possible. If necessary we can aid you into finding and hiring reliable and proven babysitting services. Furthermore, we are ready to give you tips which will permits you to not only deliver the news about the move for your kids by also prepare them for the physical relocation. London has always had a great deal of importance for various reasons, even in its early days. Archeological evidence reveals that it is one of the oldest settled places in the UK and the existing settlements there were of vital importance to the conquest of Britain by the romans. London truly flourished however during the Middle Ages, when it became the seat of the kind and ergo the capitol of the country. Contemporary London is divided into several regions among which is North West London, the main line which separates the North regions from the South ones is the river Thames. The King’s Head Theatre is one of North West London’s most prominent entertainment venues. It was founded during the early 70s of the past century and is classified as a pub theatre. It stages opera productions frequently and from 2007 to 2008 was the subject of a major renovation project which increased its seating capacity. The Almeida Theatre is another well-known venue. It is located in the district of Islington and has a maximum capacity of 325 spectators. Safety comes as a top priority with us. Naturally, this is very important for all removals in North West London that we are commissioned to do, but comes as a particularly useful trait when we are called for assistance with fragile and expensive item moving. No matter whether we are talking about really sensitive office equipment, pieces of art or antiques, or costly furniture that need to be moved, you can rest assured that we have the means and the knowledge to actually handle them with the care and respect that are to be expected from us. We will carefully pack them, use a suitable removal vehicle and deliver them to the assigned location quickly and without any complications. Just get in touch with us so that we can arrange for the details. When talking about safety we cannot miss to mention the packing and packing supplies delivery options that we offer to all our clients in North West London. We will provide you with durable double walled removal boxes, wrapping materials and labeling tools that will help you prepare your goods for the road the way they are supposed to be. In case you will overwhelmed by the responsibility to pack all of your possessions, do not worry – we can do it for you on a very competitive price. One of the best places to live in North West London is definitely the borough of Ealing. Its main commercial and administrative centre – Ealing Broadway, has been a major focal point in North West London for quite some time now. The region is also home to the second largest London borough in terms of territory – Hillingdon. Despite the large area that this borough covers, its population is just 273 936 – slightly below the average for the capital.